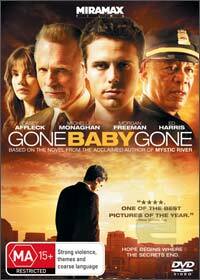 Gone Baby Gone is an interesting crime thriller that revolves around the apparent kidnapping of a four year old girl from her mother's apartment in Boston. As the police are unable to find this girl, the child's uncle decides to hire a pair of private detectives who eventually get drawn into a dark underworld that may prove something more sinister is at work here in this entertaining film. Gone Baby Gone is based on the novel by Dennis Lehane (author of Mystic River) with Ben Affleck assisting in co-writing this gripping crime thriller that almost has as noire sense to its creation. Even though Affleck may not be on par with his brothers acting, he still performs quite admirably in the film. The star of the movie is Michelle Monaghan who truly created some memorable appearances that also features a great supporting cast that include Morgan Freeman as Captain Jack Doyle and Ed Harris who is always a pleasure to watch. As characters motives are questioned in Gone Baby Gone, the creators have truly put a unique twist to this almost clichéd thriller. Featuring 16:9 enhanced widescreen with clean pictures and vibrant colour, Gone Baby Gone is a true cinematic experience that is matched nicely with its Dolby Digital 5.1 soundtrack. Some interesting special features with a great alternate ending truly makes Gone Baby Gone one of the better crime thrillers of the year.